Cash is key, and that’s why Esker’s AI-driven platform is designed for O2C excellence. Whether it’s providing an enterprise view of processes or accelerating the pace of business, Esker’s capabilities span the entire O2C spectrum. Ensure a global view of customers’ behaviour, from orders to invoices. Eliminate manual data entry by processing all orders electronically. continuously improve based on root-cause analysis. Get invoices ready prior to delivery and quickly transition to e-invoicing. Reduce DSO with tools like task escalation, root-cause analysis and more. Accelerate cash allocation to improve account visibility. Director of Business Systems │ Tessenderlo Kerley, Inc. If improving cash flow and customer experience was easy, every business would do it. Fortunately, Esker has the tools and technologies you need to make O2C excellence a reality. 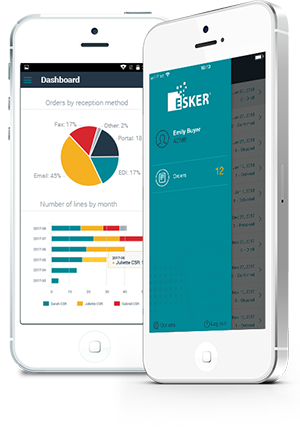 With universal access from a single platform and interface, Esker is the ideal digital foundation to unite your people and processes and deliver a superior customer experience — from initial order intake to e-invoicing, collections and beyond. Whether it’s ensuring 100% precision and recall in data extraction or overcoming order and invoice “portal fatigue,” Esker’s cutting edge AI and RPA technology helps you turn daily transactional activities into value-added business gains. Esker’s cloud-based O2C platform helps companies get paid faster by improving each step of the O2C cycle. Beyond collections and invoice delivery, Esker addresses the order-taking delays or errors that can impact cash collection and cash flow. Simply put, Esker’s O2C solutions make it easier for customers to conduct business with you. This type of end-to-end efficiency opens the door to new revenue opportunities that would have otherwise have been missed. Questions about Esker's O2C solutions? We're happy to talk you through it.